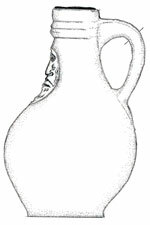 Beardman jugs, also known as Bellarmine jugs (or jars) were produced during a period of about 200 years in the 16th-18th centuries(1). Until the 19th century the jars were also called maskarons. These names all refer to the decoration on the belly and neck of the jugs. 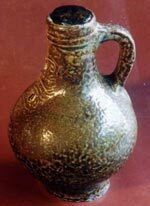 Sometimes the jugs are referred to by place of origin: eg as 'Rheinisches Steingut' (Rhineland stoneware), 'Rhenish ware', or 'Cologne goods'. Bellarmine is a famous name for these jugs - presumably after the frequently-unpopular Cardinal Bellarmine (1542-1621), a Roman Catholic theologian and one of the leaders of the Counter Reformation during this time of religious upheaval and schism. He was canonized in 1930, but had arguably been immortalized meanwhile in bearded, pot-bellied jugs. 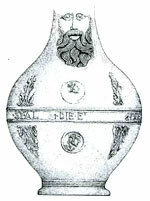 However, bottles with a beard face had been made for centuries before the life of Cardinal Bellarmine. 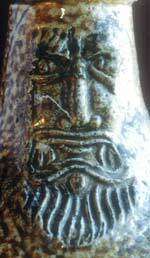 Drinking jugs with faces were not uncommon in the Cologne potteries of Roman times, when the face is believed to have represented the Horned God. The Rhineland people used a beard face, with different features, as a trademark. 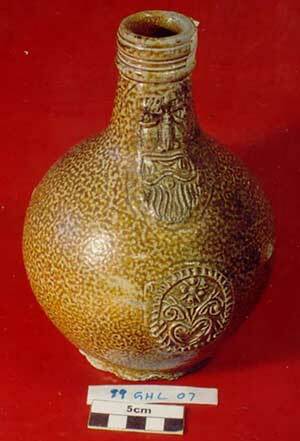 True beardman jugs were produced from the 12th century onwards. True stoneware was first produced in Europe towards the end of the C14th, and salt glazing seems to have started at about the same time. The main production centres were along the river Rhine, in the area around Cologne. Many of the Bellarmine jars were exported. The Rhineland has excellent trade connections via its large rivers. Cologne was a significant trade centre, and pottery was shipped down the Rhine to Dordrecht, and thence to England and other parts of Holland. Shipwreck evidence shows that many European ships of the C17th, and especially Dutch ships, carried a number of beardman jugs for liquid storage. Curiously, apart from jugs for a special purpose such as the transport of commercial quantities of mercury, they are rarely referred to in the historical records, which include very detailed lists of not only cargo but also of galley equipment, and inventories of personal possessions of those deceased. Beardman jugs are stoneware: water-resistant and durable, made from dense opaque non-porous clay fired at temperatures of 1200°-1280° C (2191°-2336° F). The clay turns white, buff, gray, or red and is glazed for aesthetic reasons. Jug bodies were made on a potter's wheel. After that the handle was fitted. 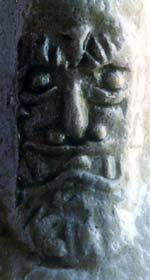 Relief decorations including the beard face were prepared separately in moulds. 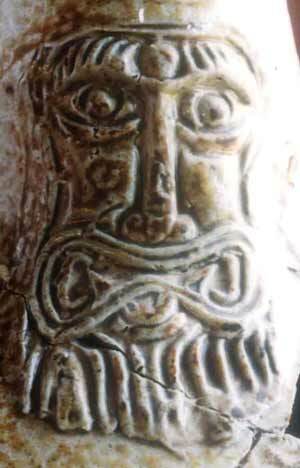 The moulds were usually short-lived, especially those for the beard face; sometimes they were used for only a few jugs each, which results in the many different figures shown. 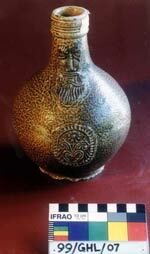 The salt glaze characteristic of a a beardman jug was formed by throwing common salt into the kiln during firing. The salt (sodium chloride) disassociates into its constituents, and the sodium interacts with the silicon and aluminium in the clay to form a thin glaze which often has a slightly pitted surface which potters call 'orange peel'. Colour is added to stoneware by dipping in a slip (liquid clay) before firing. 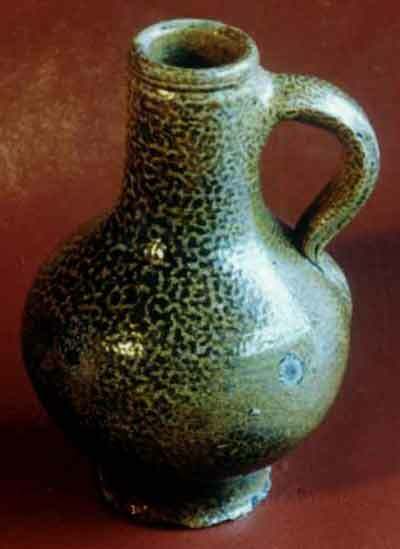 A mottled brown is characteristic of Cologne ware, and earned it the name 'tigerware' in England: this was produced by ferrous oxides in the slip. Blue and purple wares were first developed at Raeren from c.1587: the blue colour came from cobalt, and purple from manganese. Siegburg wares are usually off-white. 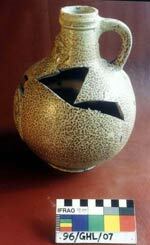 The lower part of jugs is usually colourless (apart from drips), because the artisan had to hold the jug while dipping it in the slip. 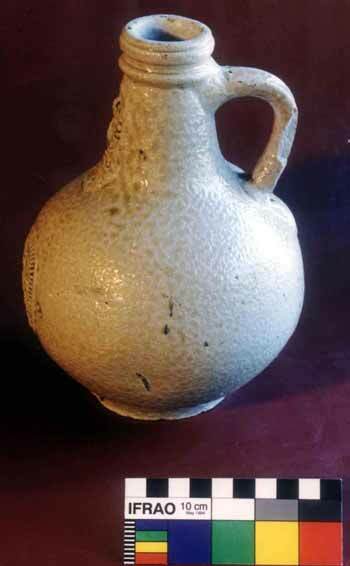 Jugs without any decoration are quite common on 17th and 18th century wrecks. 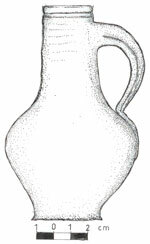 Plain jugs have been found on the Batavia (1629), Vergulde Draeck (1656), Dartmouth (1690), and Zeewijk (1727), as well as the Avondster. 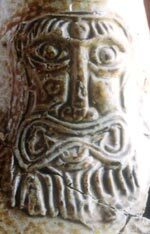 Without a bearded face it is arguable whether these should be called beardmen, but other attributes (stoneware type, origin, color and glaze) may put them in the Bellarmine category. These jugs may be classified as small (height around 120 mm), medium (around 160 mm), or large (around 250 mm). 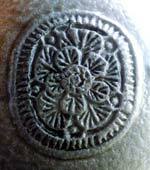 This example is from the Avondster (02-GHL-160), and is 130mm high. This type appears to be relatively unusual. Their sizes ranged from small to medium (height 120-160 mm); we have found no records of large jugs without medallions. 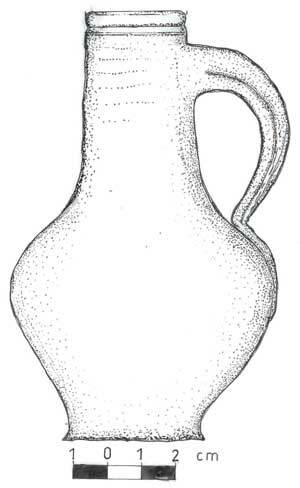 This example is from the Avondster (02-GHL-161), and is 155mm high, slightly larger than the plain jug above, with which it was found. This is the most common type, and are found in many sizes, with capacity up to about 3 litres. 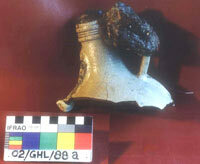 This example is from the Avondster (96-GHL-07), and is 236mm high (quite large). The height range in this group is 184-251 mm with corresponding volume of 1.4 - 2.9 litres. 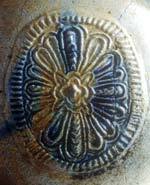 In most cases the three medallions appear to come from the same mould. 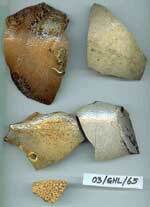 There are no examples yet on the Avondster; these three views are of one jug from the Witte Leeuw shipwreck. This type is not common. 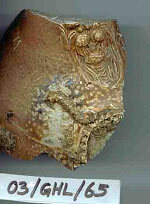 There are no examples yet on the Avondster; the jug shown here is from the Batavia shipwreck (BAT 2165). 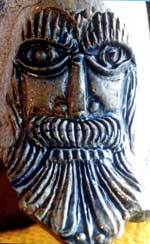 The only common features of beardman masks are a face and a beard. Different factories, potters and artists all had their own ideas, and individual moulds were used for only a few jugs each. There are hundreds of variations in features, especially in the beard, mouth, moustache, eyes and hair. We have followed the classification terminology used in the Batavia report(2). 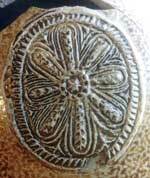 Flower or rosette - found with different numbers of petals and layers. Jug with one mask and one medallion. 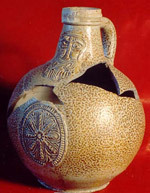 The main parts of the jug are well preserved, although some pieces of the body are missing. Height 236mm (large). Found amidships, between survey points 7-9 (starboard side) and the galley. Complete face of common type with linear beard ('a series of vertical lines curved outward on either side of the center line'), no moustache, and an hour-glass shaped mouth with two lines (the lines around the lips). The dot between the eyebrows is uncommon. 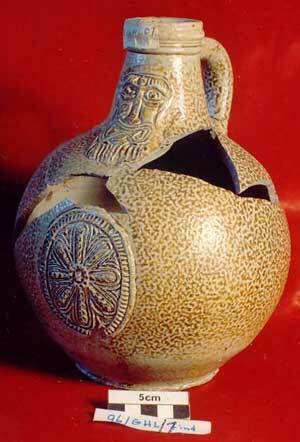 The lower part of the beard was damaged, enabling us to see how the face was applied to the body of the jug. 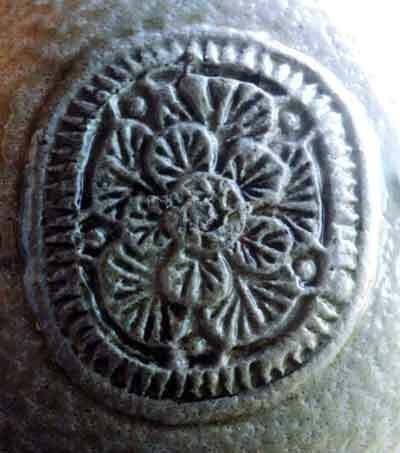 The medallion is a common type: an eight unit flower. Jug with one mask and one medallion. Complete. Height 198mm (large). 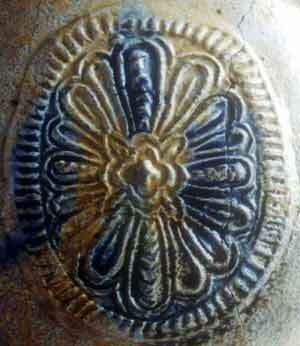 Found between survey points 7-9, near the galley, inside a barrel with a small light-blue-and-white ceramic jar and a pewter flagon. Complete face of common type, with linear beard, hour-glass shaped mouth with two lines and no moustache. 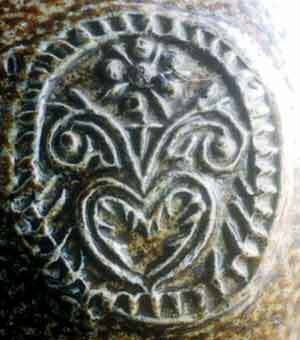 An unusual medallion, apparently a variation of the rose-crown-heart type. Above the heart can see a cross, flower (not a rose) and two branches with leaves and buds. Plain jug. Complete. Height 130mm (small). Dark brown spots on light brown and blue background. Found between survey points 7-8, near the galley, around the storage barrels - together with the stoppered jar 02/GHL/161, which is only slightly larger and similarly glazed. 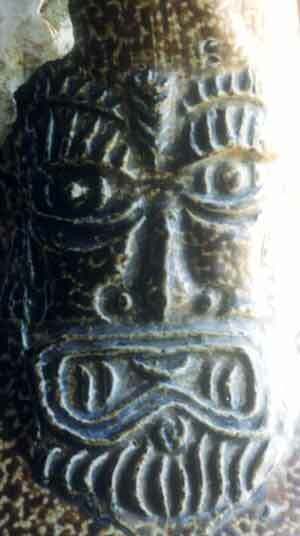 Jug with one mask. Complete with its stopper. Height 155mm (medium). Found between survey points 7-8, near the galley, around the storage barrels, along with the plain jar just described. Unusual face type, of which we cannot currently find other examples. Rough finish (poor craftsmanship?). Jug with one mask and one medallion. Large. Badly broken; six parts have been found. A fragment of wood with bark (possibly fire wood) and an iron bolt are attached by concretion to the upper part of the jar (mouth, neck, and shoulder with face and handle). The body has a medallion. The exterior has traces of blue glaze. Found between survey point 7 and the galley. Compared to the other Avondster faces, this is systematic, balanced, artistic and clear. The mouth is a 'horizontal ladder' (the line of the lips is horizontal, and the mouth is drawn with two parallel lines and cross-struts between them, like a ladder), the beard is palmette ('comprising vertical palmettes or leaf-shaped blades usually with a central line running down the middle resembling a vein'), and the eyebrows are finely drawn. 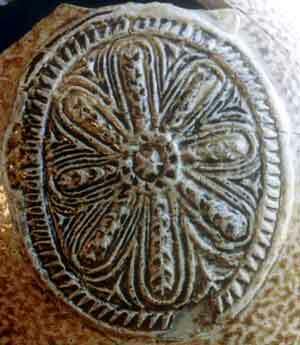 This medallion may be described as a sixteen-unit flower, or as a four unit flower with three (undecorated) segments between each unit. Jug with one mask and one medallion. Medium size. Incomplete; seven parts have been found (a small fragment of the medallion, part of the face, handle and base). 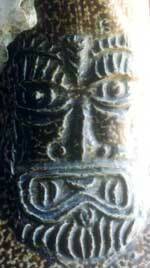 Found near survey point 13 (towards the stern on the starboard side), outside the hull. Hour-glass mouth with linear beard. Three lines under each eye. Normal untwisted handle; light green and brown color. Incomplete jug with mask. Medium or large size. 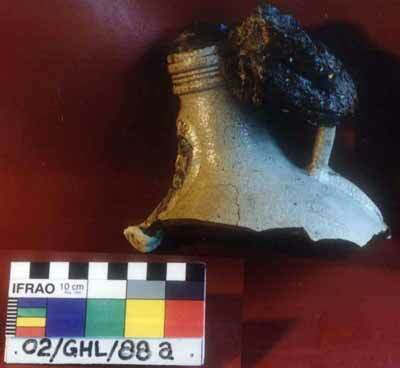 Five parts have been found (one base part, one small neck part with a section of the mask, and three body shards, but not including any part of the medallion which is probable for a jug of this size). Found between aluminum points (A.P.) 4-5, outside the hull. 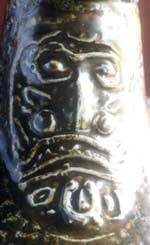 Only the lower part of the mask has been found: it has a flower pad mouth (based on dotted circles) and a round-shaped beard. Jug with one mask and one medallion. Complete; medium size. It is off-white (or light grey-beige). An unusual face, with slim oval shape and rough finish. Hour-glass mouth, interesting eyebrow shape. A two layer rosette (with two layers of petals) is common, but the double line with decoration around the outside, and the dots between petals, are both out of the ordinary. Good finish. 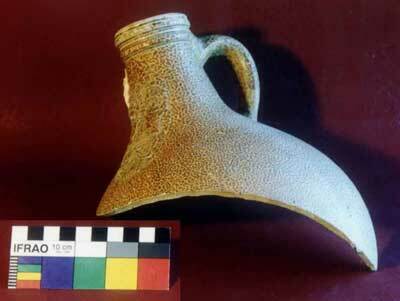 Incomplete jug with mask. Large. One part found: a neck with normal handle. Brown dots on a light brown surface. Found on the Avondster site, but the year (pre-2001) and location are currently missing. Good finish and symmetrical shape. Two-line hour-glass mouth and short liner beard. Big eyelashes. The Avondster's beardman collection displays a variety of mask types. 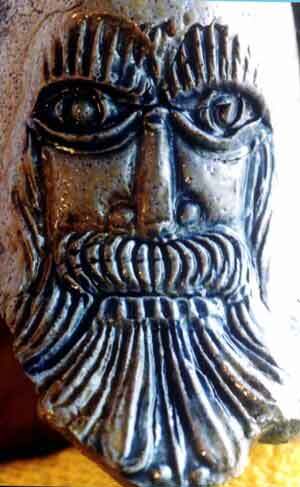 We have fine and beautiful artistic masks, like 02-GHL-88. On the other hand we have masks which are unusual, such as that with flower pad mouth, 03-GHL-65, or with rough and primitive features, like 02-GHL-161. The medallions are less varied. No heraldic or official types have been found yet on the Avondster. 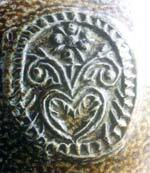 All those found have cultural and decorative forms (eg rosette, flower, rose-crown-heart). Most of the jugs have been found around the galley, sometimes in and around the large barrels. Only one jar was found with a stopper. The jugs have been found in various sizes. Small ones may have been used for special liquids such as oils or medicines. We found few undamaged or nearly-complete jugs, but many individual fragments (mainly belly parts) have been found on the site. On inspection these come from different jugs. 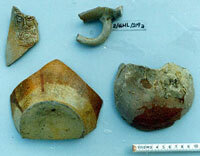 Recoveries so far thus relate to 12-20 original jugs; we will probably find more as the excavation progresses. This webpage is extracted from the first report to the Avondster Project by members of the Maritime Archaeological Unit of Sri Lanka. Authors: Rasika Muthucumarana, Palitha Weerasinha, and A.M.A. Dayananda. Jeremy Green, The loss of the VOC retourschip Batavia, Western Australia 1629, an excavation report and catalogue of artefacts. BAR International Series 489, 1989.